When consulting History to assess the crisis in Venezuela, we must remember that it has the world’s largest reserves of oil and is also rich in bauxite, coltan, and gold, all of which have been nationalized, perhaps overly. Venezuela (Little Venice) was named after Venice, Italy, in 1499 by the 2nd Spanish expedition, led by Alonso de Ojeda, sailing along the length of the NE coast of South America. The first European to reach South America was Columbus in 1498, on his 4th voyage. He found the pearl island of Venezuela, stating natives could be used to harvest them for us. In 1521 Spain built its first permanent American settlement in the what became the city of Cumaná (translated as “union of the river and sea”), Venezuela. When the Spanish arrived Venezuela had a native population of one million. From Columbus on, all were considered inferior but useful a slaves. Original human settlements originated 9,000 years ago by hunter-gatherer groups that had evolved into tribes, such as the Kalina (Caribs), Auaké, Caquetio, Mariche, and Timoto-Cuicas. The Timoto-Cuicas culture was the most complex with pre-planned permanent villages, surrounded by terraced fields, irrigated by water stored in tanks. Their houses were made primarily of stone and wood with thatched roofs. They were usually peaceful, and depended on growing crops including the root crops, potatoes and ullucos. They left us works of art like ceramics, but no major monuments. They spun vegetable fibers to weave into textiles and mats for housing. They invented the arepa (ground maize dough), a Venezuelan staple. Native caciques (leaders), such as Guaicaipuro and Tamanaco, attempted to resist Spanish incursions, but were subdued. The Spanish founder of Caracas, Diego de Losada, had Tamanaco executed. In 1528, to pay off debts owed by Charles I of Spain, Venezuela was given to the Augsburg, Germany, Welser banking family that then searched extensively for the legendary golden city of El Dorado, founding Maracaibo in 1529. In 1546 Charles revoked the Welser contract. There were about 2,000 European settlers. The opening of gold mines in 1632 increased slavery of the natives, then of imported Africans. The first real economic success was the raising of livestock on the grassy plains known as llanos.— a few Spanish landowners and widely dispersed native herdsmen on introduced horses copied the old latifundia feudal estates of Rome. During the 16th and 17th centuries, the cities suffered relative neglect. The Viceroyalties of New Spain and Peru, headquarted on the sites that had been the capital cities of the Aztecs and Incas, showed more interest in their nearby gold and silver mines than in the remote agricultural societies of Venezuela. Responsibility for the Venezuelan territories shifted to and between the two viceroyalties. In the 18th century, a second Venezuelan society formed along the coast with the cocoa plantations manned by much larger importations of African slaves, many of whom also worked in the haciendas of the grassy llanos. Most surviving natives had migrated to the plains and jungles where only Spanish friars took an interest in them — especially the Franciscans who compiled grammars and small lexicons for some of their languages. Under the Viceroyalty of New Granada, established in 1717, Caracus had a close monopoly on trade with Europe. Cacao had opened Venezuelan ports to foreign commerce. Unlike other Spanish American dependencies, Venezuela had many more contacts with Europe through the British and French Caribbean islands. Caracas had become an intellectual powerhouse. From 1721, it had its own university, teaching Latin, engineering, medicine, and the humanities. Its most illustrious graduate, Andrés Bello, became the greatest Spanish American polymath of his time. In Chacao, east of Caracas, there flourished a school of music whose director, José Ángel Lamas, produced impressive compositions. The Mantuanos (white Creole elite, wealthy from cacao) had access to a solid education, but became overbearing, and zealous in affirming their privileges against the pardo (mixed-race, free blacks and slaves) majority. Creoles are Spaniards born in America not Spain as were Peninsulares. Influenced by the French Revolution, the first organized resistance against the regime occurred in 1797, but was put down with the collaboration of the mantuanos who were afraid of radical social changes. The Napoleonic Wars in Europe weakened Spain's imperial power and put Britain on the side of the independence movement. In May 1808, Napoleon Bonaparte won the abdication of Ferdinand VII of Spain, replacing him with his brother, Joseph Bonaparte. That was the beginning of Spain's own War of Independence from French hegemony and partial occupation before the Spanish-American wars of independence began. The first major defeat that Napoleonic France suffered was at the Battle of Bailén in Andalusia in July 1808. The French rebounded to invade southern Spain. The Spanish government fled to the island redoubt of Cádiz. Taking advantage of Spain’s problems, The Caracus city council in 1810 set up a new, self-appointed, junta, claiming it also supported the pardos. In 1811, seven of the ten provinces of the Captaincy General of Venezuela declared their independence from Spain. The Venezuelan War of Independence ensued, along with that of New Granada. The First Republic was lost in 1812 following the 1812 Caracas 7.7 earthquake that killed 20,000 and the Battle of La Victoria. The campaigns of 1813 saw many rivals contesting for power as loyalists to Spain or to independence parties seeking the Second Republic of Venezuela. Simon Bolívar recruited a Mantuanos army and invaded Venezuela from the southwest by crossing the Andes and re-establishing the Republic of Venezuela on 6 August 1813, Santiago Mariño and Manuel Piar, a pardo from the Dutch island of Curaçao, were successfully fighting royalists in eastern Venezuela. So two independent Venezuelan states were set up, one in the west headed by Simon Bolívar at age 27, and one in the east headed by Mariño. José Thomás Boves, initiated a widespread pardo movement against the restored Republic. Bolívar and José Félix Ribas held and defended the mantuano-controlled center of Venezuela. In the east, the royalists started recovering territory. After suffering a setback, Mariño and Bolívar joined their forces, but they were defeated by Boves in 1814. Republicans were forced to evacuate Caracas and flee to the east, where, in the port of Carúpano, Piar was still holding out. Piar did not accept Bolívar's supreme command, and once again Bolívar left Venezuela and went to New Granada (1815) to liberate it. In 1820, liberal sections of the military under Rafael del Riego established a constitutional monarchy, which precluded new Spanish invasions of America. Before his recall to Spain, Morillo signed a truce with Bolívar. In 1821 at the Battle of Carabobo Bolivar’s 8,000-strong Gran Colombian army defeated the 5,000-strong Royalist army that included British volunteers. The victory ended the Royalist cause. In Venezuela, a province of Gran Colombia, José Antonio Páez, backed by the ruling clique in Caracas, initiated the separation of Venezuela in 1826. Bolívar returned to Bogotá, where vice-president Francisco José de Paula Santander complained about Venezuelan insubordination. In 1828, due to opposition he faced both in Venezuela and in New Granada and because his Great Colombia had started to disintegrate, Bolívar named himself dictator. After escaping an assassination attempt, he arrested suspects including Admiral José Prudencio Padilla, a pardo who had fought Nelson at Trafalgar and became the founder of the Colombian Navy, executing him for treason. Later he was exonerated. Santander was also suspected and sentenced to die but Bolivar exiled him He returned in 1832 to lead a 2nd administration, continuing to execute most of the rest of the Spanish officers still in captivity, who had been saved by Bolivar Santander's murderous pursuit including General José Sardá, accused of leading the plot to kill Bolivar. Peruvians invaded Guayaquil so Bolívar returned to Quito in 1829 to repulse them, but the invasion had petered out before he arrived. Back in Bogotá, Bolívar pleaded for unity and, though he had offered to resign various times, this time, when Great Colombia had a new constitution and a president, Joaquin Mosquera, Bolívar finally did resign in 1830. The same year his close friend, Antonio José de Sucre y Alcalá, the 4th president of Peru and the second of Bolivia was assassinated Páez not only had declared the second independence of Venezuela but also had promoted a campaign against Bolívar who, sick ans exhausted, rode to the coast with the intention of leaving the country, He died near Santa Marta in Colombia at the age of 47. Turmoil continued. The Federal War, 1859-1863, was the most bloody since the War of Independence. The start of the 20th century saw several notable international crises: the Venezuela Crisis of 1895 under Joaquín Crespo (a dispute with Britain over Guayana Esequiba) and the Venezuela Crisis of 1902–1903 (Venezuela's refusal to pay foreign debts) under Cipriano Castro. There were coups in 1945, 1948, 1958, 1993, and 2002. Venezuela suffered political turmoil and autocracy, remaining dominated by regional caudillos (military strongmen) until 1958, when the country started a series of democratic governments. But problems continued. Despite being elected twice as a populist, 1974-79, and 1989-1993, Carlos Andrés Pérez proved less generous with hand-outs. He supported: no price controls, privatizations, and laws to attract foreign investment. His 10% increase in the cost of gasoline caused a 30% jump in fares for public transportation. An 1989 popular uprising was crushed by the army with an official death toll of 276, but actually higher. There were 2 attempted coups in 1992. In 1996 Pérez was impeached for embezzlement of funds and sentenced to 28 months in prison. Venezuela had 4 presidents before Hugo Chávez who was elected in 1999. John Bolton, US National Security Advisor, accused Venezuela, Cuba and Nicaragua of being part of a “troika of tyranny.” Chávez served until 2013 when he died and his vice president, Nicolas Maduro, took over. Chávez had humble origins but did graduate from high school then, seeking social justice, he joined the academy of military sciences, took part in many activities, attaining the rank of lieutenant colonel. After a failed 1992 coup, he turned himself in and was arrested. In 2000, with a new set of relations between socioeconomic classes, voters approved a new constitution and re-elected Chávez, placing many members of his Fifth Republic Movement party in the National Assembly, calling the process the Bolivarian Revolution, organised into different government-funded groups. In April 2002, Chávez was ousted in a coup by military and media groups, hut he was returned to power after two days due to demonstrations by the majority. He then embarked on a long process of sharing the benefits of the county’s resources that had been enriching the Venezuelan elite and foreign companies. Its oil reserves had been tied to 32 agreements with 22 companies. Revenues became 30% of GDP and 80% of export revenue by 2001. To share the profits with all, he raised taxes 80%. Companies fled so he nationalized oil in 2007, losing the means to sustain and increase production, yet in 2012 he was easily re-elected. A member of the Organization of Petroleum Exporting Countries. Venezuela is highly dependent on oil whose price fluctuates rapidly. In 2014, it dropped, causing the economy to contract each quarter since. The Central Bank's monetary reserves also declined. A severe shortage of goods followed, with necessities in short supply. In 2007, on paying off its debt 5 years ahead of schedule, Venezuela terminated official financial relations with the IMF and the World Bank that it joined in 1946. Both say they will offer assistance if called upon. Chávez nationalized oil production, banking, telecommunications, metallurgy and mining. The high price of oil allowed him to fund ambitious public programs. This included a Caracus - Buenos Aires rail link that was to service places in between. Due to all this, plus redistributive policies, the poverty rate was cut from 50 % in 1998 to 30% in 2013, When Chavez died in Mar 2013, Vice President Nicolás Maduro was elected narrowly, determined to continue social equality. But the price of oil sank and the economy worsened. Maduro opposed daily street protests using lethal force. The UN reported 8,292 executions, 2015-17, yet he won re-election in 2018 by jailing opposition leaders and threatening job losses. Canada, Panama, and the USA imposed sanctions. The per capita income was $7,808 in 2013. Inflation accompanied falling income. By 2017 it was predicted to reach 720%. This affected the ability of the economy to remain viable. A US financial embargo in Aug 2017 plus a trade embargo in Jan 2019 have hurt considerably. Of a 32 million population, 3 million destitute and hungry people have fled the country. This is forecast to rise to 8 million. Reported refugee destinations are: Colombia 1.1 million, Peru 520,000, Ecuador 220,000, Argentina 130,000, Chile 100,000, Panama 94,000, and Brazil 85,000. Canada resettled 40,000 Syrian refugees but has taken in only just over 100 Venezuelans. In the USA the Trump administration has brought refugee admissions to historic lows, from the 110,000 yearly limit set by Obama in 2017, to 45,000 in 2018, and now 30,000 officially but much lower actually. Maduro’s main opponent is Juan Guaidó, a founder in 2009 of the Popular Will Party, a member of the 153-member Socialist International, an organization promoting a fairer world. Guaidó argued that Chávez had become too totalitarian and that Maduro had seized power illegally. Building a following he declared himself president, immediately accepted by the US that led a group of 65 Nations to support him against Maduro who was supported by the UN itself and 50 nations including China, Cuba, Iran, Turkey and Russia from whom Venezuela has bought fighter jets. In August 2018 Maduro survived an assassination attempt when he was attacked by a small drone. He accused the U.S. and Colombia. After Trump abandoned nuclear disarmament treaties, Russia retaliated in December 2018 with a visit of Tupolev-160 supersonic bombers to Venezuela’s La Orchila Island air base, then announced Maduro’s approval to base some there. Russia then landed 200 troops and can justify this dangerous move by citing NATO bases on its borders as well as the fact that the US has interfered in far more countries for decades. Despite closing hundreds of bases in Iraq and Afghanistan, the United States still supports almost 800 military bases in over 70 countries. The UK, France, and Russia, have about 30 foreign bases combined. Venezuela is now a battleground among socialism, capitalism, dictatorial regimes, reformers, and the Supreme Tribunal of Justice in Exile that sentenced Madura to 18 years in prison. We need to negotiate, peacefully without cruel sanctions. Venezuela needs help without the fear of a commercial or military takeover. Current flash points include: the US withdrawal of diplomatic staff, the financing of 90 Guaidó trips to foreign countries, his taunt that Maduro’s administration was too dysfunctional to arrest him, Maduro’s response of arresting him and barring him from civic office for 15 years, and Trump’s Oval office hosting the wives of Gaidó and his chief of staff. This is another world-threatening situation that demands immediate dialogue and cool heads. Many of the Latin American countries that the US has persuaded to join the Guaidó camp are those in which the US has supported cruel dictators that have caused the exodus of millions of persecuted migrants against whom the Trump administration is insisting on completing a formidable, expensive, and unnecessary wall to deny them refuge. In controllable numbers, migrants have been beneficial to receiving countries. But they invoke genocide, war, disruption, disease, ethnic hatreds, and terrible suffering. It is so much cheaper and sensible to support world organizations that promote and finance the eradication of problems at home that incubate such infections. We do have the intelligence and wherewithal. Yes, remedies can be very painful, but do we have a choice if our goal is to save our planet and the treasures it still offers? During WWII, I served in the UK with 419 Squadron, Royal Canadian Air Force, Bomber Command. In 1942 I met and married Joan Saunders of Leamington Spa, Warwickshire, but had only a few weeks together when I was shot down on my 17th operation to spend 800 days as a POW in 5 locations including the North Compound of Stalag Luft III, home of the Great Escape. After 70 years we remain happily married and have 5 wonderful daughters. Staying in the RCAF after the war, my numerous assignments include 3 years out of Edmonton, Alberta, with a USAF/RCAF detachment, flying B-29s all over Alaska, and Canada especially the Arctic up to the Pole, The Korean Airlift from Dorval. Quebec, the DEW Line (Cape Parry), and NORAD. My last transfer was to Colorado Springs. Retiring after 25 years, I taught World History, US History, Physical and Political Geography, International Relations, and Algebra in Colorado Springs. 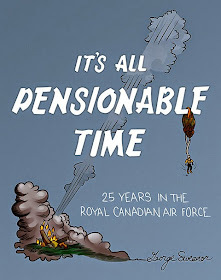 Since 1986 I have been the editor of the bimonthly 971 RCAF Air Marshal Slemon Wing of the Air Force Association of Canada newsletter (www.971WingAFAC.com).